I was the subject of a hideous experiment the other day. I was given a glass of white wine by my wine connoisseur* brother-in-law, and asked to try it. It was very nice indeed, off dry, a little sweeter than I usually choose but perfectly good. It wasn’t the best wine I’ve ever tasted, but it was far from the worst. Some of the Co-Op’s Fair Trade selections win that particular award hands down. Along with most people, I harbour deeply ingrained opinions about Liebfraumilch, and none of them are good. The associations with seventies dinner parties, poor food and a general unsophistication about wine are just too strong, and cause me to pass swiftly on to something more modern, dependable, reliable. Maybe yet another bottle of Australian Chardonnay? I like my wine to be made by the French, Australians, Italians, some form of South American, etc, but never by a German. This all leaves me in a confused and mildly agitated state. My built-in prejudices and quickly blossoming wine snobbery tell me loud and clear that Liebfraumilch shouldn’t be touched with a barge pole, somebody else’s barge pole at that. Yet here I am, enjoying a lovely glass of smooth and interesting German white wine on a warm early summer evening. To top it all, at £3.22, it was an absolute bargain. 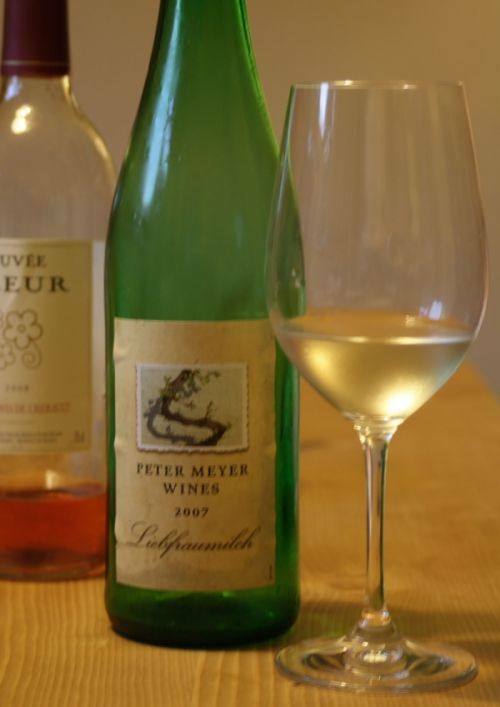 Peter Meyer Liebfraumilch 2007 Rheinhessen, Germany. *I’m not using this description lightly. He really is a professional wine merchant of many years standing and currently runs the wine website for a high-street-brand-you-will-have-heard-of.